A lot of money's flowing into the New Order these days. People have strong feelings about preserving, protecting, and defending highsec from its enemies. Matrea D is climbing up the ranks of the top New Order shareholders. Matrea's purchase of 2,500 additional shares certainly didn't hurt. 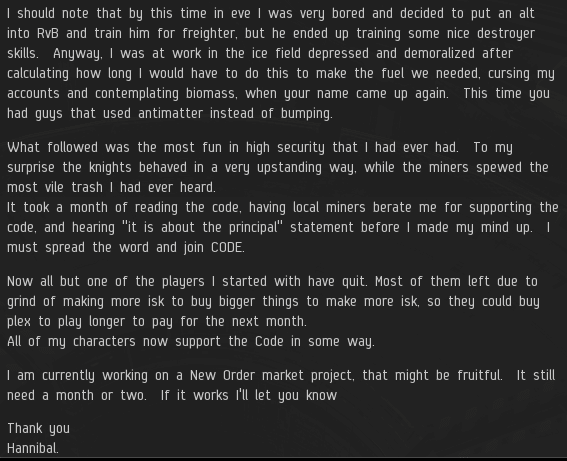 It sent us over the 436, 437, and 438 billion isk marks, and earned Matrea a Triple Supreme Protector's Tip of the Hat™. Meanwhile, The Conference Elite corporation continued to benefit from players throwing shares their way. 1,200 additional shares were purchased from three different contributors since the last update. We passed the 439 billion mark, and TCE earned a Supreme Protector's Tip of the Hat™ by proxy. New shareholder time! 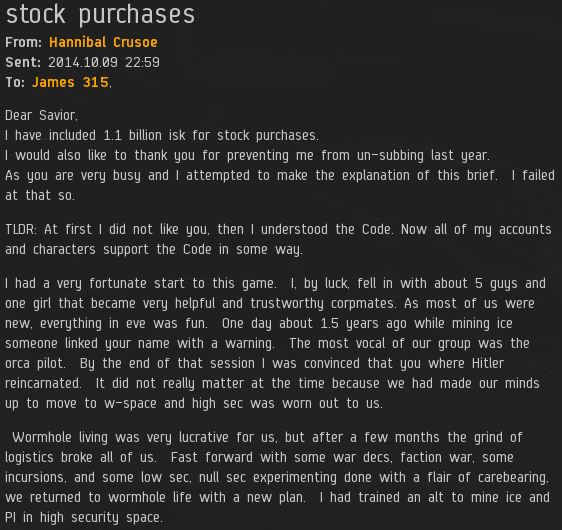 Hannibal Crusoe bought into highsec's future with a purchase of 1,100 shares. We're over 440 billion now, and Hannibal gets a Supreme Protector's Tip of the Hat™. In addition, Hannibal wanted to share his story about how he decided to put money into the New Order. Story time! We're seeing a lot of this these days. The anti-Order propaganda and bias is losing its power. People are catching on. And we're keeping players subscribed to EVE! Could an official Community Spotlight be in our future?